The Great Depression was in full swing in 1936. However, Roosevelt’s New Deal was now three years old. Things were starting to improve. The U.S. was going back to work and the economy was begrudgingly following suit. Americans didn’t know about the misdeeds being perpetrated in Germany, nor that they would again be sending their sons overseas in a mere 6 years. What they did know was that those who were employed were lucky, and those with permanent, steady jobs were even luckier. The people in this video were among the lucky. They are shown here building Chevrolets in the Flint, Michigan plant. Click it to watch those beautiful machines being built. The soundtrack on this video is awful, but the quality of the video is impressive. 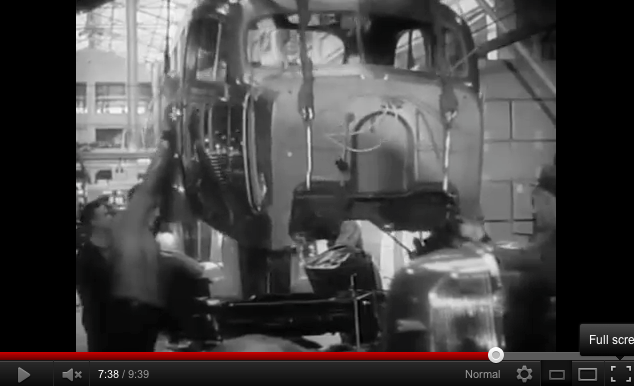 Also impressive is the automation involved in the manufacturing process, even in 1936. So hit the mute button, watch, and enjoy! Makes you want to rush down to the Chevy dealer and pick up a brand new ’36 sedan, doesn’t it? This entry was posted in 1930s, Items of Interest (Not for sale), Sweet videos and tagged 1936 Chevrolet, 1936 Chevrolet plant, Chevy assembly line. Bookmark the permalink.